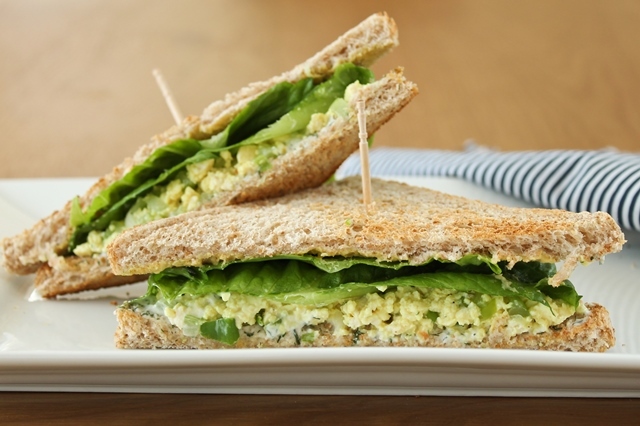 Tofu Salad with spring onion and celery on toasted wholemeal bread with Dijon mustard, dill mayo and romaine lettuce. Phew! It's been awhile!!! I do actually have quite a few things lined up to blog but if you visit my daily blog you'll know I've been on quite the calorie restricted diet lately as I'm keen to lose about 8 pounds before my summer holidays. In fact I tend to put weight on when I'm actively posting recipes here - all that testing, over and over, lol! 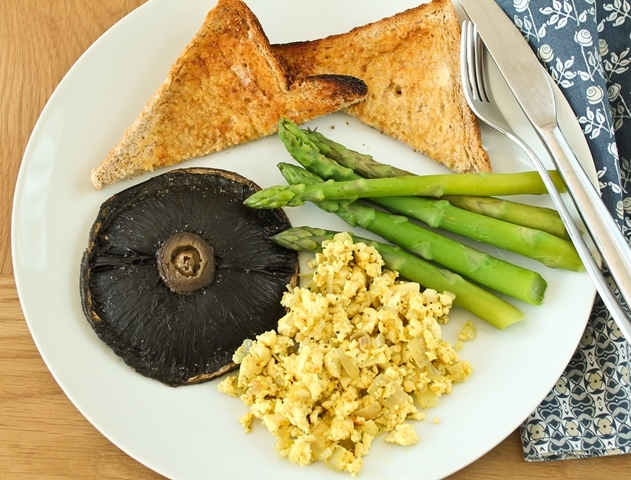 Now, the other thing you'll know if you visit the daily blog is that I've become positively addicted to my tofu scramble, but unlike the post on the blog here I've just been having the scramble without the cheesy chive waffles, roasted cherry tomatoes and spinach. 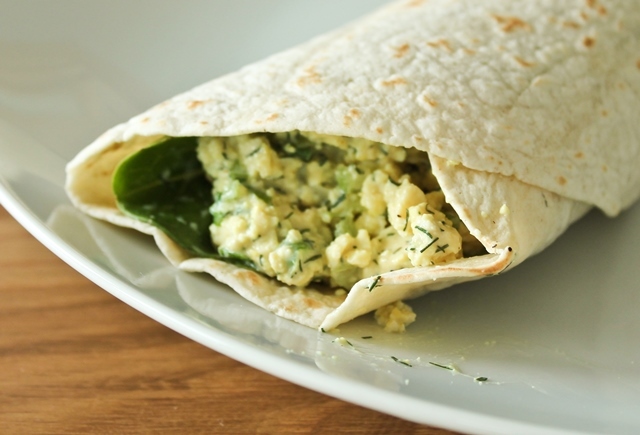 Not that it's not good - I love that meal but I've been needing something quick and easy. Then I started to think about egg sandwiches. 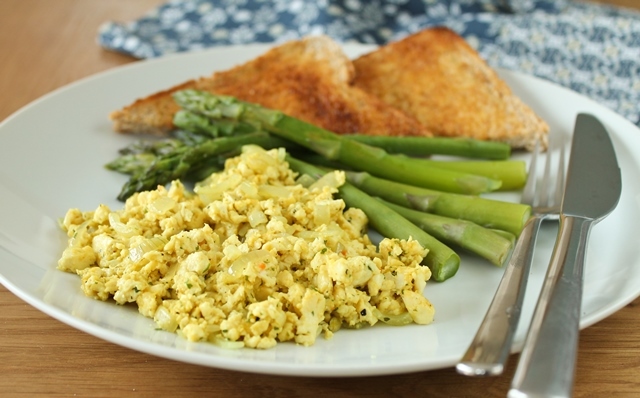 Why, I have no idea as the mere smell of an egg sandwich makes me gag and always has, but that tofu scramble is so scrumptious and such a fine replacement for "eggy" things that I thought I would try it. 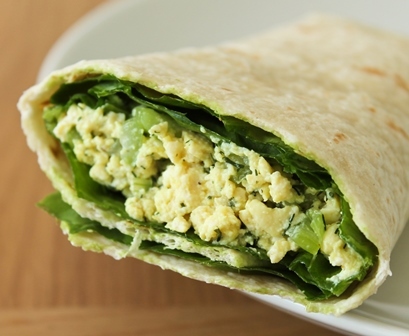 I have of course made tofu egg-style sandwiches before. 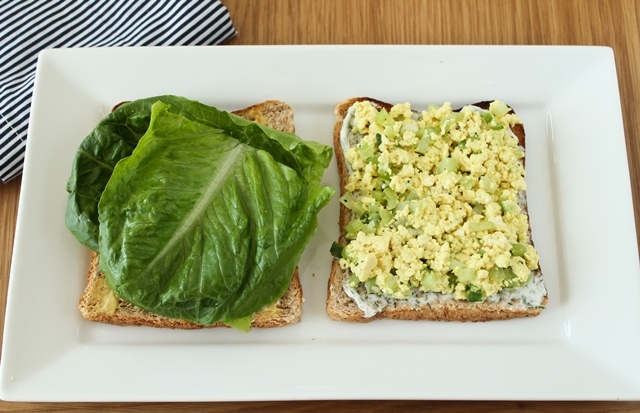 I made the dill tofu salad sandwich from VWAV way back when and really liked it but I wanted this one to be more egg salad sandwich like. • Yes, the Marigold OrganicVegan Bouillon Powder (the red/orange tub) is a crucial ingredient here. I love the taste and as it already has turmeric in it gives this dish a lovely yellow hue. You can of course use whatever vegan bouillon powder you can find and add some turmeric for colour. If you use a different brand make sure you taste and season as need be. • For those in the UK/IRE I use Cauldron's Original Tofu, it doesn't actually state if it is soft, firm or extra firm but the texture is very soft, but it's not silken so for a similar texture I would recommend a soft, non-silken tofu. 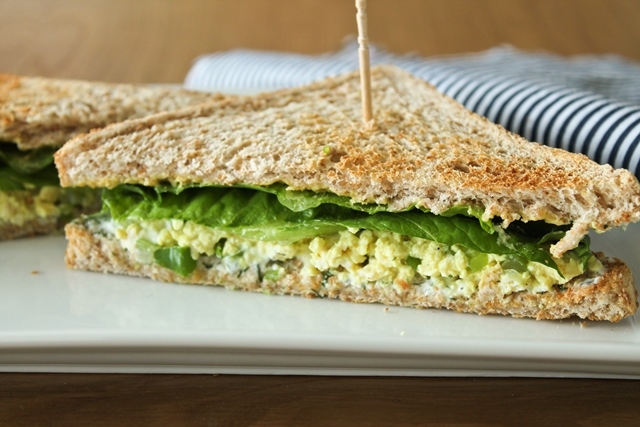 • Egg salad sandwiches mix the mashed egg with mayo - I don't do that here as the tofu mixture is soft and creamy enough. I do add mayo to the bread however, for flavour, but you could always mix it in with the tofu if you prefer or if you have a "drier" tofu. • I got 2 sandwiches out of this but if I was using larger bakery style bread and wasn't dieting, then I would stuff the whole lot in! So, I would say it makes 2 small sandwiches, or 1 large :-) For the record, it doesn't keep very well as the mixture gets a little 'wet' when it sits in the fridge overnight so I would recommend just making what you need here. 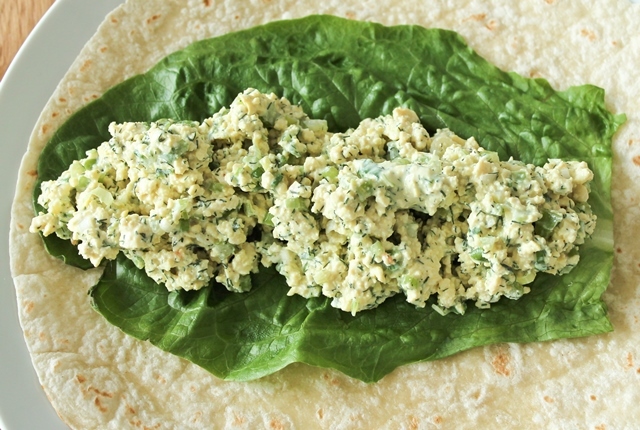 Wrap the tofu in some kitchen towel then wrap in a clean dish towel and place something heavy on top to press, I use a cast iron grill pan. Leave for 10 minutes, change the paper towel and press for another 10 minutes. In a pyrex measuring jug dissolve the 1 tsp of bouillon powder in a splash of hot water. Fill with cold water till you have 125ml or ½ cup and mix well. Crumble the tofu into this, make sure it is all covered, then cover with cling film and refrigerate for at least an hour to marinate. Drain the tofu using a fine sieve and get a non-stick frying pan on medium heat. Add the tofu, the garlic halves, some freshly ground black pepper and 1/4 tsp of bouillon powder and fry until most the liquid has gone but it's still a bit creamy. Remove the garlic cloves and scrape the tofu into a bowl and leave to cool a bit. Add the spring onion and celery and mix well. Cover and chill in the fridge until completely cool. To assemble: Toast your bread. This is essential as it makes it easier to eat and you won't have soggy bread that flops all over the place as you try to eat! If you like, spread with some vegan butter, I wanted to keep the calories low so didn't bother. Mix the mayo with the dill and spread on 1 slice of toast. Spread the other with some Dijon mustard. Top with the tofu salad and some lettuce. Enjoy! Press the tofu between several sheets of paper towel for about 15 minutes. 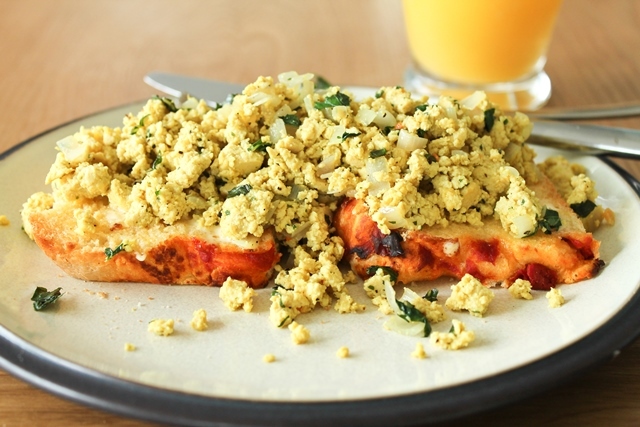 Crumble the tofu. 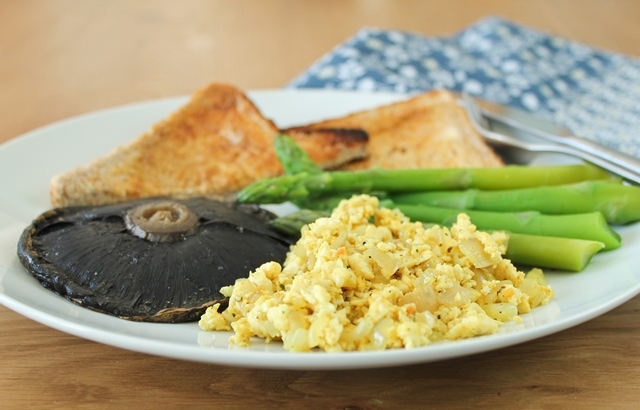 Heat up a non-stick frying pan and add the tofu, garlic halves and bouillon powder. Fry until most of the liquid cooks out of the tofu and it is fairly dry, I like to get some slightly golden spots on the tofu here, you can cook it drier than the version above as you'll be adding a dressing. Remove the garlic and transfer the tofu to a bowl to cool to room temperature then add the rest of the ingredients, mixing well. Cover and chill in the fridge until cold. Made this today for lunch as a sandwich. It's a great recipe and was really tasty! I added some cayenne pepper to the dill mayo which gave an extra kick :-) Love your recipes, I come back again and again, thank you!! Oh yum ... this looks delicious! I'd love every single version you presented. thanks for sharing ... I've never seen that bouillon before ... I'm going to look for it. Thanks :-) I do love that bouillon, it just goes so well with tofu - hope you find some! Last spring/summer was the first time growing things in it and it was very successful, we are trying loads more things this year - hopefully all will grow well! 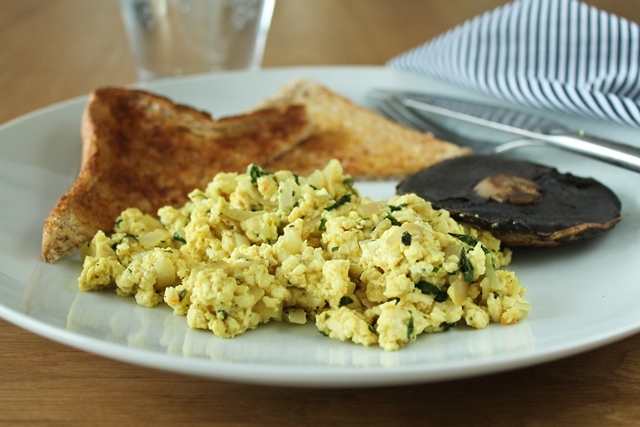 i made your basic tofu scramble recipe yeaterday from the waffle post and it was delicious! mixed it with a bit of mayo today for a sandwich and it is soo good!have only recently found your blog- am a cork girl living in the uk, great to see an inspiring vegan voice coming out of cork! Hi Shelley! 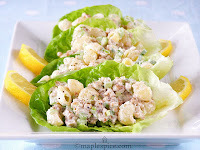 Thanks for the comment - so glad you liked the scramble, great idea to mix with mayo for an easy sandwich too!